Today I do the impossible! I show you how to make Healthy Sausage! Now by healthy sausage, I mean it tastes like sausage and it has the same texture as sausage. It is however made from Textured Vegetable Protein instead of pork and the other random things you find in unhealthy sausage. My healthy sausage patties are 158 calories each. They have 9 Grams of Fiber (50% requirements), 14 Grams of Protein (30% requirements) and only 3 Grams of Fat (.05% requirements). Your average unhealthy sausage patty is 230 Calories with 198 of those Calories coming from Fat! My sausages are even healthier than normal veggie patties!!! Do you know anyone that you’d like to share this with? Add 1/2 Cup of Textured Vegetable Protein with 1/2 Cup of Hot Water and let sit for 5 minutes after stirring. 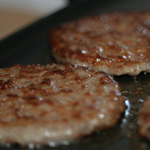 After everything above is mixed together (Makes 4 Big Patties), fry each patty on 60% for 2 to 3 minutes per side. When I first started dieting, like most people, I thought that meant I’d be eating bad food. After I discovered all of the low calorie alternatives that were available by cooking with Textured Vegetable Protein I was able to eat healthy versions of the food I loved. If you like the idea of eating healthy alternatives, check out my healthy meatball sandwich here Delicious Healthy Sandwich. hi bro, youtube is not available for our country now, few days ago i started learning php and im confused about RETURN and GLOBAL. when should i use them ? I’m sorry to hear that 🙁 You use return to return a value back to the code that called a function. So if you had $varName = doSomething() $varName would now contain the value passed back by return. Technically everything variables and functions in PHP are global. That just means the variables are available everywhere in your PHP code. If you create a variable inside of a function it is considered local to that function and can’t be accessed from anywhere but from inside of the function is which it was created. Thank you soooo much for this sausage recipe! I am new vegan and was missing the taste of sausage. O boy!! This is delicious! I can see this on pizzas too!!! Thank you again for sharing your recipe!!! You’re very welcome 🙂 I very much enjoy recipes like this as well. I have more vegan recipes planned for the future.